Kits for constructing wooden figurines. Characters and vehicles are moveable and can be assembled in 15 minutes or less. Extra character skins & templates available for download below. Made in Japan. 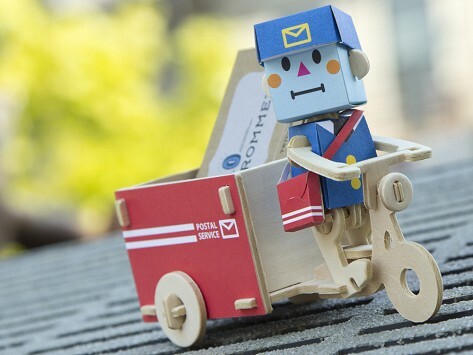 Assembled characters: 1.2" x 1.5" x 3"
Ships flat; packaging dimensions: 12" x 6" x 0.2"
Easy to assemble, this cute little mailman and cart holds my business cards and sits on top of my desk. Perfect for this task. Perfect in every way! This item is extremely well designed and a joy to put together! I would recommend it for children and adults, alike. I just love my little mailman and will probably order another Play Deco design. An adorable gift for a retiring postman! The Japanese Maker of Piperoid (also a Grommet) is at it again with a construction kit called Play-Deco featuring another cast of quirky characters—this time made from paper and wood. Each craft contains pre-cut wood panels and perforated paper overlays for easy assembly to bring your character of choice to life within 15 minutes. No glue, tape, or scissors necessary. Which character will you choose? The Postman tends to run late because he knows and talks to everyone in town as he makes his deliveries. Kenji is a young entrepreneur who zips from one meeting to the next on his private jet. Junko loves to drive fast, but watch out if she’s not wearing her glasses! The Postman & Wagon, Kenji & Airplane, and Junko & Supercar all feature moveable parts so you can pose them in different positions on your desk to add a little fun to your homework space or work place. You can even download extra paper overlays or a template to create a look all your own. Designed for ages 12 and up, but, you’re never too old for Play-Deco. This DIY craft makes a great gift for tweens, teens, and all those grown-ups out there who are still just kids at heart.